MMD National Youth Secretary Bowman Lusambo has urged youths in Zambia to utilise their God given talents to create employment opportunities. Mr Lusambo said the high levels of unemployment calls for young people to be innovative and use their talents to create jobs. He said Government alone cannot manage to offer jobs to all the unemployed young people. 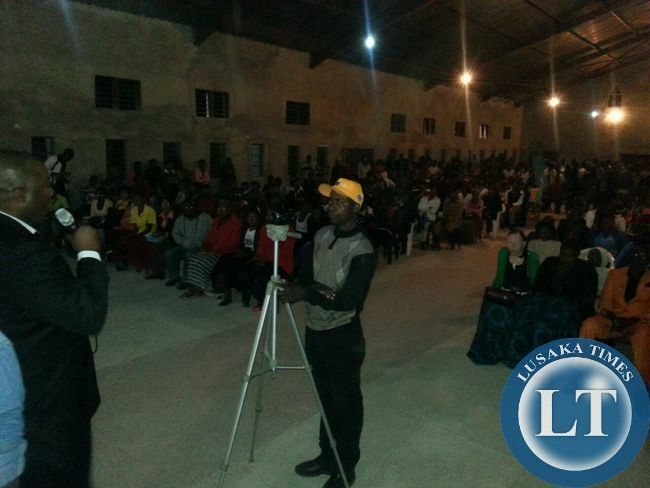 Mr Lusambo who is also aspiring candidate for Kabushi parliamentary seat for 2016 was speaking on Friday evening when he officiated at a well attended fundraising gospel concert in Kabushi in Ndola. 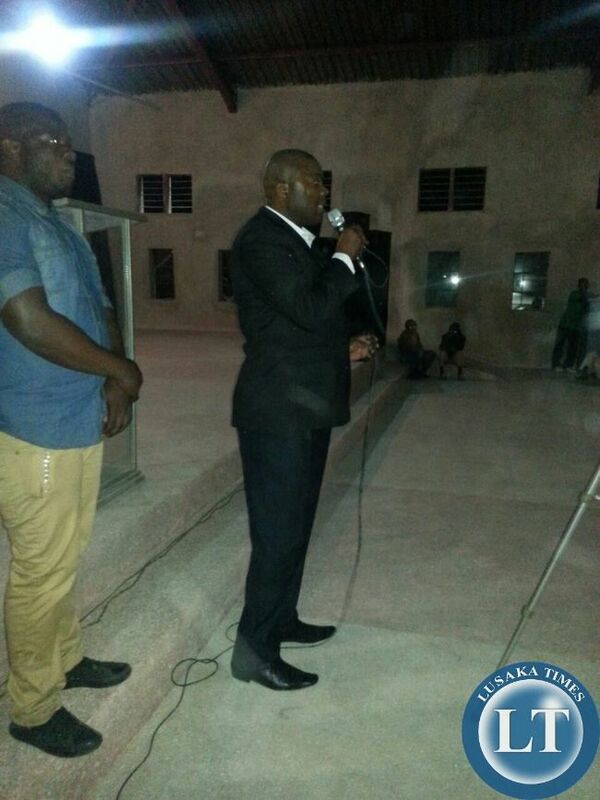 The gospel concert was also graced by renowned Gospel artiste Kings Malembe Malembe. ‘We all have God given talents, let us go out there and use them. You saw how Malembe Malembe was using his talents to sing and dance for God, you can also search within you and find the talents that God deposited in you and create a job for yourself and other youths,’ Mr Lusambo said. Mr Lusambo has since proposed that the organisers of the concert introduce an annual choir competition involving all Churches in Kabushi which he will sponsor. ‘The top three Choirs will win a cash prize and recording deals in order to develop their talents and create their livelihoods through the talents Let us work together with the organisers of this concert where i was just invited to officiate as Guest of Honour and introduce a Choir competition,’ Mr Lusambo said. The MMD youth leader said he has decided to stand in Kabushi in 2016 because he wants to uplift the living standards of residents in the constituency especially the young people. ‘We should scale up skills development for our youth in order to enhance their creative and innovative capacities. Kabushi is such a vast constituency and it should be able to create its own job opportunities for young people here,’ he said. At the same event, Mr Lusambo pledged K 5,000 towards the musical project in the area. Being a cadre is creating employment for himself, ok thats good to hear. What talent did you use to get that post? Now are you aspiring for a bigger one in 2016 because of advancing your talent? Come down brother and witness the reality on the ground and stop talking theory. @Man Kenya, please accept the truth. We go to school to broaden the level of understanding and create our destiny. We should learn from our brothers and sisters from Nigeria who are the largest economy in Africa. And, if I may enquire, is the job of parasites which are jumping from one party to another? That is what Stella Sata was trying to say with the tomato metaphor. Again, the fact on the ground is that job creation in Zambia is only for the politician. What we need to do is reduce the pay to MPs to allowances so that they can take the tick-like suction tendencies away from the national purse. It is getting as embarrassing as it is pathetic. 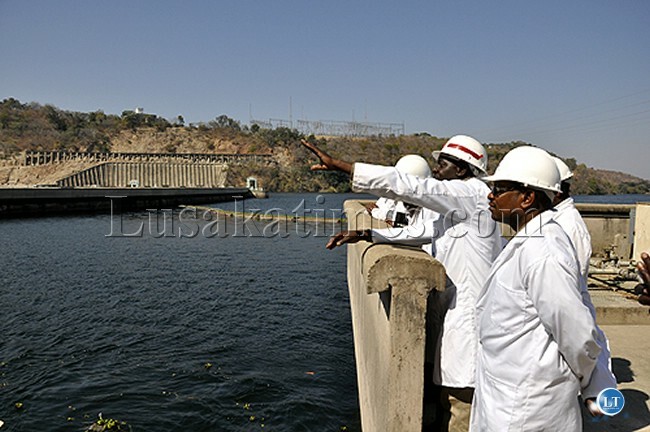 Lusambo has created a job for himself by becoming a cadre. All youths are expected to emulate this detrimental initiative. Good luck. A youth at 25yrs has not made any money to start a business. A person at 55yrs, having made money during years in employment plus acquisition of experience, is the one to retire and create jobs. Encourage early retirement to create room for youth employment. Why should an old person at 60yrs cling to a job and meanwhile a youth has to suffer to get a job? That is OK for civil service, but, if a person is in his/her 60’s and has created private entity which employs directly couple hundred employees, why should retire? To create more yobs? Or to risk current ones? As to creation of jobs by young or old entrepreneurs, well that can ONLY be done if the government wakes-up and start creating conductive environment. Unfortunately, the biggest obstacle to such environment has been created by the government and, instead of urgent corrective action, government is trying to “pass the bucket” on the very same people which expect government to “govern” instead of issuing statements which insult even bellow average intelligence. that’s great Mr Lusambo.well said.These are politics we want and no fighting or insult. What a douche bag. Why do we have the government to begin with? It is the governments responsibility to create jobs and the reason we vote for people in these places. Why do we have schools? So people can go and learn and then being able to support themselves. There are no proper schools, some children are cramped in a class room with no chairs and tables. The impact of education on national economic growth and competitiveness by investing in the skill level of a nation’s population increases national productivity, and education leads to higher wages. If a child has not been to school, how can they get a good job or any job in this matter. A lack of government support and backing is the reason we have high unemployment rate among youth (16-24). Government needs to pull its socks up. If only I did not know Lusambo personally and that he is an opportunistic prick prone to criminal and fraudulent activities I would have said he is talking sense. However I know of too many people he has conned over the years, including my self…so I know better that to believe anything that comes out of his mouth. At close to forty years he should also stop referring to himself as a ‘youth’. He is now middle aged.